Sarah Palin confounds Rachel Maddow: "Tell me what this means"
Sarah Palin continues to entertain us with her superior intellect. Could it be that she formulates her words in a manner only some can understand? Well, Rachel Maddow has asked for our help in deciphering a strange and convoluted statement Palin made at the rally against the Iran Nuclear Agreement. "I want you to suss this out for me," Rachel Maddow said. "Just listen to the words here. Tell me what this means." 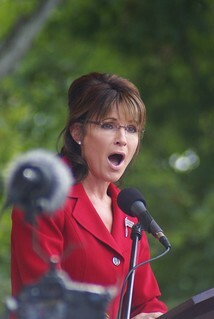 "'So up there in Alaska, across the way Russia,' Sarah Palin said. 'You know there is a name for this taking advantage of America. There is a Russian name for that. And it is called 'fortushka.' And that means Obama's window of opportunity. So as Obama leads from behind the skirt of his right-hand man, Valerie Jarrett, then it's up to Congress to close that window. He may propose. You dispose, Congress. You gotta be in it to win it because we want peace. With unapologetic mighty red, white, and blue, will have peace.'" "Senator John McCain's choice to become president of the United States should anything have happened to him in the White House," Rachel Maddow said. "Never forget: Today she is the face of Republican opposition to the Iranian nuclear deal." It's tough to be anything other than baffled at her words. Yet Palin's thought process must be examined, as it represents a substantial portion of today's body politic. Maybe if we figure out how she rings others' bells, we might be able to un-ring them -- permanently.